Many environmentalists in New Zealand, including many of the leaders in the Green Party, are seemingly unaware that fluoride is a potent environmental poison and, in fact, was the pollutant that kick started today’s environmental movement. An air pollution disaster in Donora, Pennsylvania, USA, was responsible for bringing air pollution to the attention of scientists. Fluoride History researcher, Chris Bryson an award winning BBC journalist who spent ten years researching fluoridation, found that the “Environmentalists don’t know that the disaster in Donora was almost certainly caused by Fluoride”. 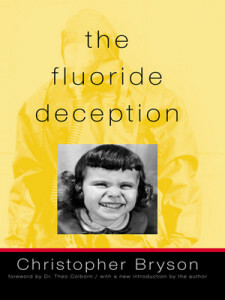 Watch an interview with Chris Bryson who explains his findings or read his book The Fluoride Deception. Also, check if there is a copy of the book at your local library. It is now known that if fluoride is allowed to be discharged into the air it destroys crops, cripples livestock and harms people. Damage is so severe that fluoride producing industries, such as phosphate fertiliser and aluminium industries, are required to have a cap on their chimneys to stop fluoride being discharged into the air. “Airborne fluorides have caused more worldwide damage to domestic animals than any other air pollutant.” – US Dept. 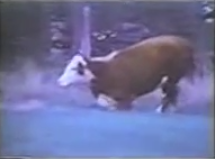 of Agriculture, 1970. 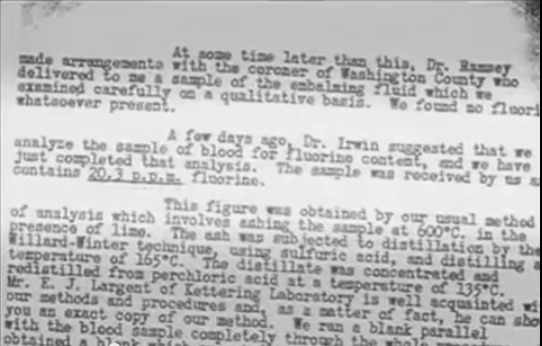 Between 1957 and 1968 “fluoride wasresponsible for more damage claims against industry than all twenty [nationally monitored air pollutants] combined.” – Dr Edward Groth, Senior Scientist, US Consumer Union. The most notorious air pollution disaster in US history was the Halloween air pollution incident in Donora, Pennsylvania. A mill town south of Pittsburgh. In the aftermath of those deaths a researcher by the name of Philip Stadtler, a Chemist, investigated. He did blood analysis and he measured high levels of fluoride in the blood of some of the injured and the deceased. He published that data in the Chemical and Engineering News and data that found high levels of fluoride in nearby vegetation. The Public Health Service came in and said that Fluoride wasn’t responsible. 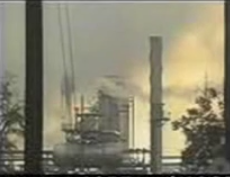 The PHS story was that it was a mixture of air pollutants and bad weather that had caused the disaster. 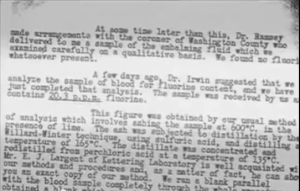 Chris Bryson uncovered a memo from Alcoa showing that secret tests were completed on one of the deceased and the fluoride results were in line with what Stadtler found. 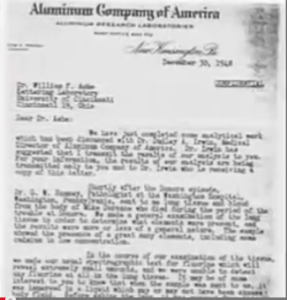 The memo explains why Environmentalists don’t know their own history. Donora jump started the Environmental Movement. Environmentalists don’t know that Donora was almost certainly caused by Fluoride.